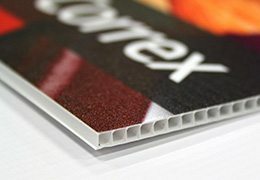 Correx is a tough, durable and impact resistant board. Lightweight with a corrugated centre (aka fluted polypropylene). A popular use of Correx is for Estate Agency boards. Artwork is required preferably as a Hi-Res PDF, however, Illustrator (AI); Photoshop TIFF (flattened), EPS are also acceptable. Print ready artwork can be supplied at 25% of the final physical size of the banner. Artwork must be supplied at 300dpi and preferably as a high quality PDF with 5mm bleed and crop marks. If you are sending multiple files, please clearly indicate the different items in the file name. Please note we are unable to accept any Microsoft files as printable artwork including: Word, Publisher, Excel & Powerpoint – these CAN be used as a reference for creating finished artwork from, but this would be subject to additional artwork charges.